I'm Roi Ratliff and I'm going to build your new custom home. 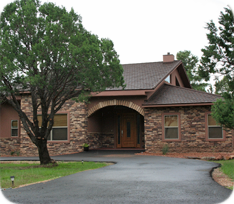 Ratliff Custom Homes has been building quality, affordable homes in Lincoln County for over a decade. Our business has thrived on repeat customers and referrals from previous clients, local businesses, and realtors. I provide my homeowners with a superior level of craftsmanship, dedication, experience, exceptional communication, and a reputation of integrity. I'll ensure personal attention throughout the building process to guarantee that your home building endeavor is a satisfactory and joyful experience, one that disproves the nightmare homebuilding stories that are commonly heard. Providing input and advice throughout the complete building process, together we will create a home design that suits your lifestyle, turning your dream home into reality. Separating Ratliff Custom Homes from other builders, I will personally work on your site, supervising the process, every day, each step of the way. I am available 24 hours a day, every day of the year for any and all questions that you may have by cell phone. I do not have anyone field my calls or return calls for me. If you have new innovative designs, if you have questions about your home, or would like to meet with me, just call. I am always available by landline, cell phone, text, email, or fax. Because I am always on the job site, I can personally ensure that your home will be completed on time and within budget. Superior communication and relationships built on trust are crucial to the success of your project. You will be included in the process, educated along the way and provided detailed information about what steps will be taken and when in order to complete your dream home. I will personally attend to every question and concern that you have at any time that is convenient for you. Our work doesn't cease when your home is complete. I will check in with you regularly, ensuring your satisfaction with your new home. Call me today at (575) 937-2022 to discuss your ideas or to take a personal open house tour of some of our quality custom homes built for clients just like you! I am completely bilingual in Spanish and English. My family roots come from two cultures; a hard-working Protestant family from rural southern Arizona and east Texas and a tight-knit Hispanic family from Mexico. My entire life has been an equal mixture of both of these cultures. We travelled often while my parents instilled in me the value of work, education, and the benefit of utilizing your intelligence in a practical manner. Living at an early age in Third World surroundings allowed me to become humble and patient later in life and to appreciate the value of money earned by hard work. Born in Florida, I subsequently lived in Colombia, Mexico, Alabama, and Texas. Upon graduating from the University of Alabama with majors in International Relations and Spanish, I decided to use my linguistic skills working for an industrial engineering firm based in San Diego, CA. In total, I worked four years in Mexico, creating incentive payroll systems and honing my engineering skills. I was offered multiple jobs from several companies that wanted me to help run their outsourcing operations, but, I felt a need to express myself in a different way, pursuing another career path. 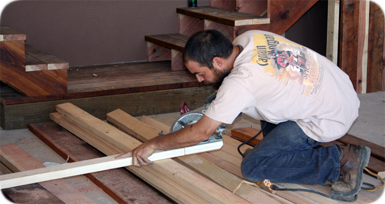 In 2000, I returned to New Mexico and applied for my General Contractor's license and the rest is history. Building homes for me has never seemed like a job. I enjoy the process of creating something that has never existed other than in my mind. At times, when I complete a house and look at the finished product, I can still see the undeveloped property that was there before the construction started, the big tree that I didn't want to cut down, the view through the trees that wasn't quite visible but I knew would exist once the house was built. Building someone's home, in my opinion, is one of the most personal things you can do with a person. You reach into another person's needs, desires, and personal tastes and reconfigure it into something tangible. Envisioning someone's personal dream house takes insightfulness, patience, and knowledge. I don't claim to have seen every style of house but I listen to my clients, ask questions, and take pride in every detail. I have built small projects like custom octagonal decks and million dollar luxury homes. The same care for quality and workmanship is present in every project I build. I surround myself with an effective and highly skilled work crew and physically install every facet of the build. I don't subcontract the house like most general contractors do or show up intermittently to inspect other people's work. "After working with Roi for just a short time, he had our full confidence. I can't imagine building a new home in Alto, while living in Dallas, without total trust and confidence in your builder. We had that with Roi..."